In a blog post I published two weeks ago – see here –, we started discussing how Robert M. Grant (2007:249) looked at differentiation and the provision of uniqueness, and at how a firm’s opportunities for creating uniqueness in its offerings to customers are not located within a particular function or activity, but could arise in virtually everything that it does. We also mentioned a number of drivers of uniqueness identified by Michael E. Porter (1985:120) that are decision variables for an organisation that wishes to gain a competitive advantage through differentiation. This post will continue with the application of the rest of the drivers to German Bundesliga club Borussia Dortmund. With this driver, Michael E. Porter addresses the level of technology used in making the product stand out from the competition in reference to its design and physical production. In regard to our exercise, we alter the headline of this driver to ‘Digitization embodied in design and manufacture of brand experience’. Techtarget.com defines the term digitization as ‘the process of converting information into a digital format’ (techtarget.com, retrieved 17 February 2015). It is observable that Borussia Dortmund digitises its brand experience by enhancing its complementary services with digital technology (see section Complementary services) and by using the three main sectors of converged media: owned, paid, and earned. Paid media refers to traditional ads used to reach strangers that have little or no touch-points with products of Borussia Dortmund. Solely focussing on digital channels, such ads include banners, Facebook ads, promoted tweets, YouTube trueview and in-video ads, Google Adwords, Instagram ads, and similar. The only paid advertising that I have seen by Borussia Dortmund is ads on Facebook. Maybe that it because I am not in their target audience in regard to ‘strangers they would like to market to’ or the club simply does not spend much on ads in general. It this case, we cannot assess the brand’s performance in regard to paid media. Owned media encompasses all corporate content used to reach customers of a brand. This content is published on official digital channels owned by the company, like website, microsites, blog, smart phone apps, and all other social media channels. As the term ‘owned’ suggests, content published on these channels does not require advertising budget. The posts are targeted towards people that have already showed an interest in the brand and its products, and therefore, gave permission to actively start a communication stream with them. As mentioned in the ‘Complementary services’ section in Part 1 of this blog (see here), Borussia Dortmund invests a considerable amount of resources in regard to the sensorial dimension of the brand. Hence, the relevance, quality and appearance of the club’s owned media can be considered top-notch. 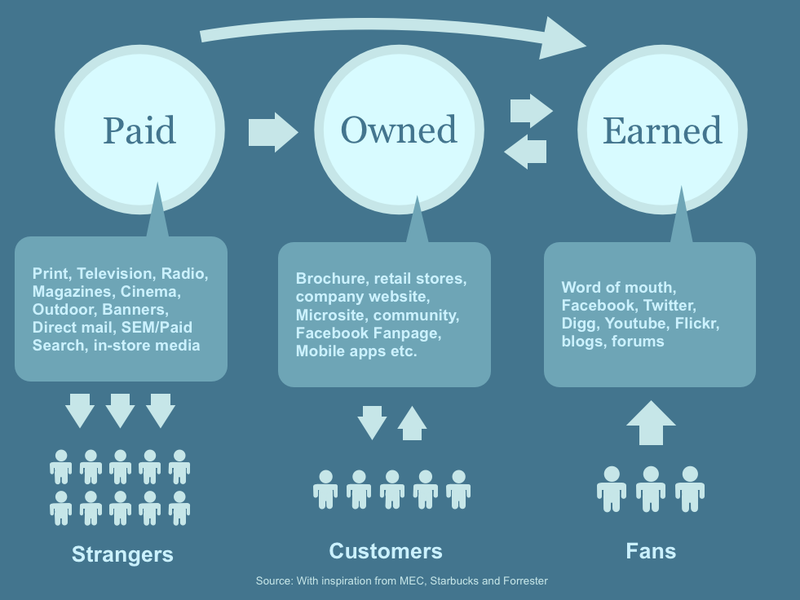 Earned media is defined as ‘any publicity you haven’t paid for that’s owned and created by a third party’ (Hubspot Blog, 2014). This can be fans taking selfies with their BVB jerseys on and share them on social media; or game-viewers writing amateur-reviews of the match. Davis (2012) quotes Katona, Zubcsek & Sarvary (2011) and states that it is generally considered that ‘earned’ media visibility (word‐of‐mouth, amplified by social media) more effectively induces interest in a product than promotion via ‘owned’ or ‘paid’ media, because of the perceived greater credibility of earned media. Borussia Dortmund does a good job at rewarding fans that spread the BVB brand through Twitter by retweeting earned content from them. Spezia (2011) mentions Marwick & Boyd (2011:141), who write that famous folk take to twitter to perform acts of public recognition and brand maintenance, to affiliate with cultural aspects through retweets or sharing links, or to communicate intimately with fans. Clarity. “How your end user will benefit from your products or services needs to be explicit across all your communications. (Inc.com, 2013)” Borussia Dortmund makes sure to create visuals and copy for all their communication in the highest possible quality to depict the great emotions any fan, stadium visitor, or game viewer will experience when following the brand throughout any media outlet. Exceptional Value. “Every touch point with customers or prospects should provide them exceptional value. (Inc.com, 2013)” Borussia Dortmund offers high-quality content (visuals, copy, offers, usability, and more) on all their digital outlets. Collaboration. In regard to ‘Earned Media’, Borussia Dortmund engages their fans and followers on different digital media channels by asking questions or motivating them to take pictures in context with the BVB brand and posting them, and the brand then retweets most of the created content as a thank-you gesture, which also shows the different facets of the brand. In addition, the club also engages in sponsoring deals (bvb.de, retrieved 28 February 2015) with different organisations such as Sparta-Bank, Turkish Airlines, Opel, and more. An Intentional Emotional Connection. Most of the BVB communication is based on emotions. As mentioned above, the brand pushes out emotional copy underlined with high-quality visuals to create and maintain an intentional emotional connection with their followers and fans. An Eye on the Competition. Comparing the brand experience of Borussia Dortmund with other football clubs in Germany or abroad, it can be observed that BVB is not necessarily the most innovative brand in terms of offering new experiences, but the club makes sure to maintain a consistent high quality. Relevance. Christina DesMarais claims, “In addition to making sure your products or services are right for the times, you need to make sure you and your team continue to grow as people. (Inc.com, 2013)” By being the number 1 attraction in Dortmund (Tripadviser, 2015) and having the highest football attendance in Europe with an average crowd of 80,295 visitors per match (footballeconomy.com, 2014), it is safe to state that the BVB brand is of high relevant to its fans and the city of Dortmund. Given the mentioned facts, it can be assumed that the human resources necessary to achieve such a status are of high quality. Confidence. The club’s downward spiral in regard to football performance in the first half of the Bundesliga season 2014/15 is a good example of how the brand kept a stiff upper lip and found their way out of an almost secure relegation fight. Management and staff stayed positive and confident – also, loyal to longtime manager Jürgen Klopp –, which eventually helped to steer the BVB Express back on track. The main concern in regard to location is convenience created for the organisation’s customers (Porter, 1985). As mentioned a couple of times in part 1 and part 2 of this blog post, the home turf of Borussia Dortmund – Signal Iduna Park – is the main attraction in Dortmund. Being known as the legendary Westfalenstadion it is a magnet for visitors from near and afar. Additionally, having a reputation for great fan support and fantastic football entertainment, enthusiasts travel the extra mile to visit what could be defined as a football temple. As an attention-creating medium that seeks to stand out for the competing establishments, which BVB does with ease, being the largest fan stand in Europe and always filled with 25,000 fans. As a message-creating medium that uses symbolic and emotional cues such as ‘true love’, ‘community’, ‘authenticity’ and more. As an effect-creating medium, employing an intense, colourful, cheerful environment to create or heighten the want for more BVB experiences. Businessdictionary.com defines the term vertical integration as, “a merger of companies at different stages of production and/or distribution in the same industry. When a company acquires its input supplier it is called backward integration. When it acquires companies in its distribution chain it is called forward integration. (Retrieved on 28 February 2015)” For example, a vertically integrated football club may end up owning their own stadium, football school, media agency, logistics company, and caterer. Michael E. Porter identified two more drivers: i) Procedures influencing the conduct of each of the activities, and ii) Skills and experience of employees. We will not discuss these two drivers, since we do not have enough information to make a useful assessment. 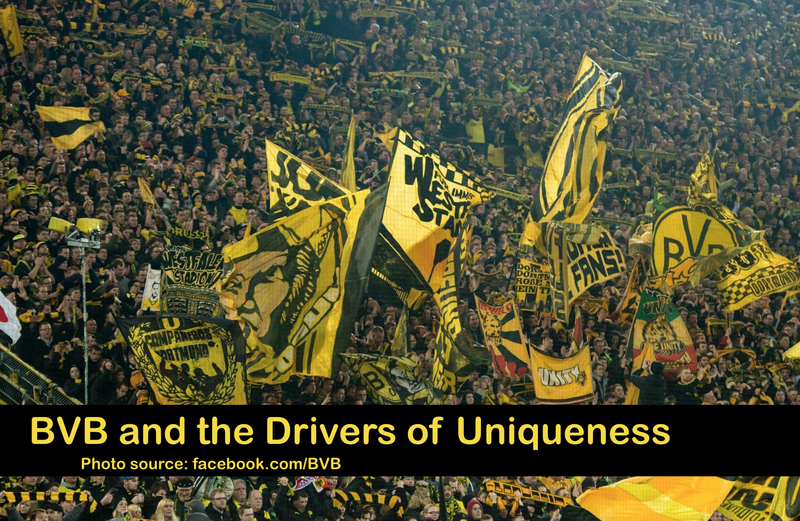 Part 1 and 2 of this blog post discussed Michael E. Porter’s «Drivers of Uniqueness» as applied to German Bundesliga club Borussia Dortmund. It is safe to claim that the BVB brand has indeed a unique brand identity. Its fans and their football temple – the Westfalenstadion – are one of a kind, and the atmosphere created in their servicescape can visually radiate emotions through digital media and TV broadcasting, as well as engage followers and viewers all around the globe. Furthermore, by owning or having vertically integrated different companies and organisations, processes for creating an impeccable brand experience can be managed tightly and quality of the BVB brand product secured. Borussia Dortmund can be proud of their strong and unique brand.